18yr old teenage singing sensation, Justin Beiber, apparently is in love with the tattoo trend, as he adds another tattoo to his rapidly expanding collection in a matter of weeks. The new owl ink tats drawn on his arm, was made public by the super star himself, when he post a picture of his new tattoo with the caption “ Befo the Paps get me2” via instagram. Just last month, Justin revealed a new ink crown tattoo on his chest via twiter, probably affirming to himself for eternity, that he is a king in his chosen field. 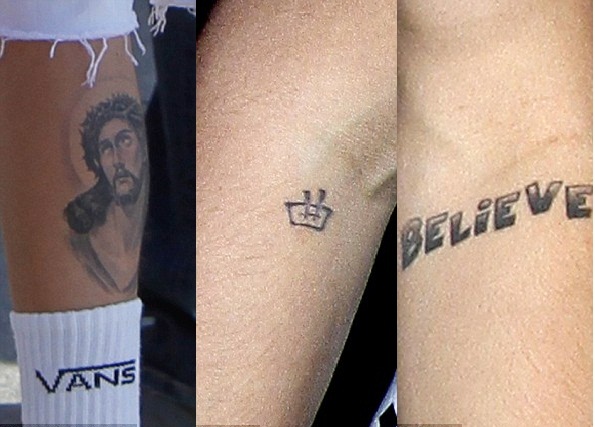 The owl black/grey inking of his, adds to his collection of tattoos, which include, a drawing of Jesus on his leg, ‘Believe’ tattooed on his forearm, the Japanese Kanji symbol for music on his right arm, and a crown on his chest. At the current rate, at which Justine is tattooing his body, one wonder if the song star, will have any available clean surface on his body, by the time he is twenty.